I’m honored to be the military advisor for Elliot: A Soldier’s Fugue at Profile Theatre, and I’ll tell you why. We’ve all seen dozens if not hundreds of works of military fiction written, directed, and produced by creatives who mean well, their heart is in the right place, but they don’t ask veterans for their advice on their work and they focus on the veterans PTSD and/or their injuries. As far as the details go, I am very grateful that people believe the military experience is worth writing about, but some of that gratitude disappears, whether I like it or not, when I see small things done wrong. For example, the salute is a simple action that is done wrong so many times and could be so easily corrected. Only the tip of your ring finger touches the end of your right eyebrow. Easy! But it is almost always overlooked and when that happens the whole work loses credibility, at least to the population of the audience the work is trying to honor. It sounds nitpicky to many, but that is what the military is: attention to detail. Not only did Josh, the artistic director, and Lauren, the Director of Education and Community Engagement, ask me to come in and speak to the actors, they believed in my idea to bring veterans in before a showing of the play so the audience could get a better understanding of the diversity of our veteran population. First, when I came in to speak to the cast of this amazing play (Pulitzer Prize finalist! ), they were so welcoming and eager to hear about my story as a Purple Heart recipient with multiple tours. We all sat in a small room, with more people than chairs, and I told my story. I described the depression, rage, and guilt that comes with surviving a coordinated ambush in combat and then being sent home to attempt a transition back into the civilian life. They created an atmosphere safe enough for me to tell them some of my most vulnerable stories including past thoughts of suicide and acts of self destruction. Afterwards, they asked questions for a while. Some about their characters, other about my life, but also some questions about veterans in general. These last questions, I noticed, were changing their views on how they pictured veterans. At the end I must have hugged each one of them before leaving. Last Sunday, before the show we had a panel of veterans meet some audience members and take questions. On the panel was a Vietnam Veteran who is also a Native American, a former Marine with five (3 to Iraq and 2 to Afghanistan) combat tours, a female veteran who was deployed to protect the Eastern Seaboard on a Destroyer on 9/11, and an Army infantryman who lost both legs in Iraq, and me. After I introduced them all and asked a few questions we opened it up to the audience and the questions were amazing, respectful, and intelligent. By the end of our little session we had changed many of their views on what, exactly, a veteran is. I know this because they told us… in those words. There is a stereotype of “the veteran” in our society. We are supposedly all white, male, gun ho, non-creatives with our souls and hearts torn apart by war. That stereotype was completely blown away after the meeting. I saw it happen in real time, and that is why I’m proud to be a part of Elliot: A Soldier’s Fugue. This play helps people see the humanity in the warrior. 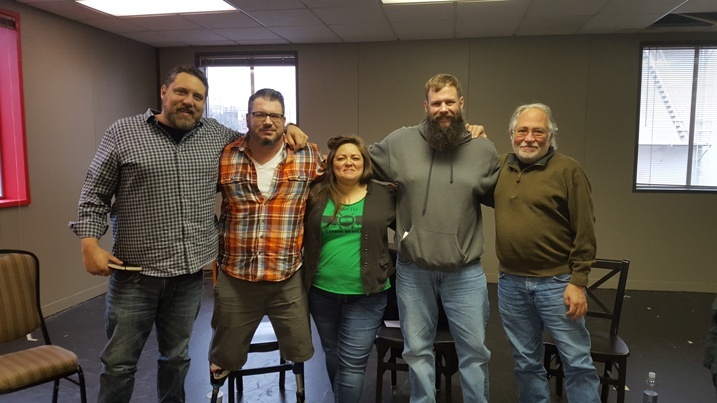 I’m honored to be a part of this production because it’s been my mission to not only help other veterans for the past 10 years, but it’s also been my mission to change how those who haven’t served see our military members. Yes, we have lived through very traumatic events and many of us suffer from those memories or even physical injuries, but we, as a society, should focus on our abilities and not our disabilities. We need to know that our veteran population (10% of this country) are just as diverse as the population as a whole. Profile’s Community Council are people from the Portland area of varying ages, ethnicities and backgrounds who are invited to view the backstage process from beginning to end and share their perspectives with our communities.